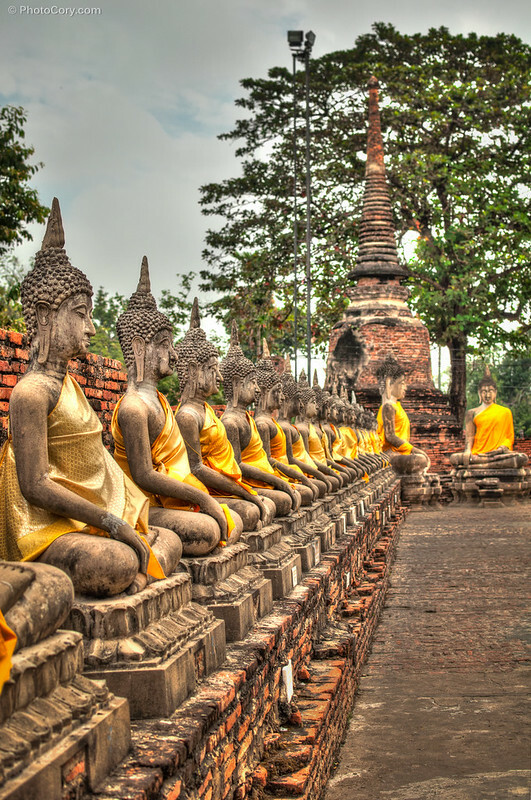 Ayutthaya is located at one and half hours from Bangkok. 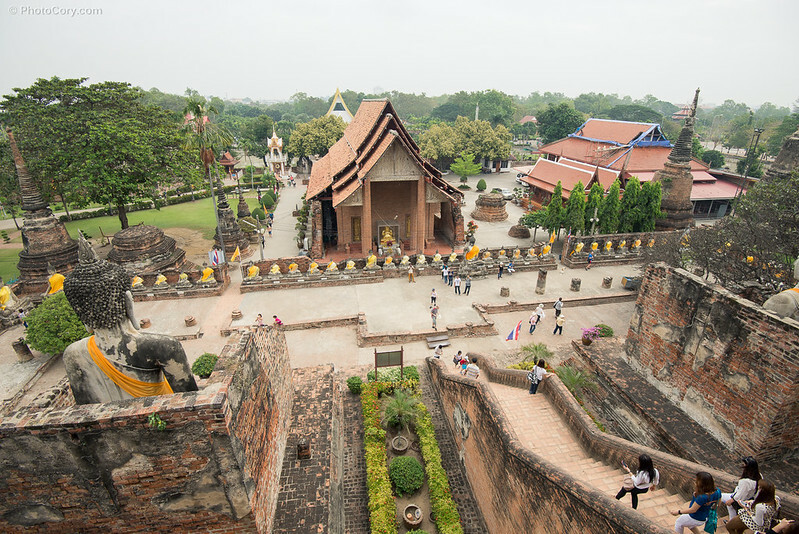 For 400 years Ayutthaya was one of the biggest and most important cities in the world, with a blooming commerce and over a million inhabitants. To protect the city, the king surrounded it by brick walls and defense towers. 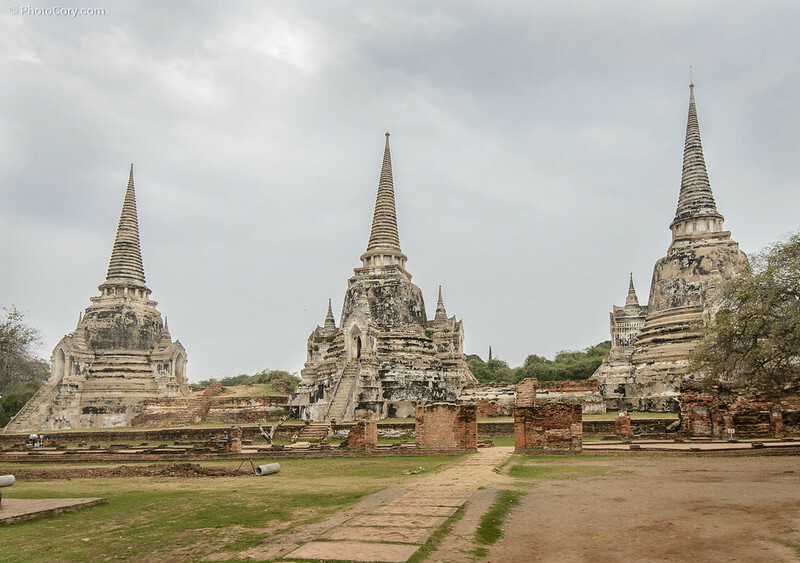 Unfortunately, in 1767 the Burmese army, after many attempted attacks, finally managed to conquer the city and they destroyed the Royal Palace and decapitated thousands of Buddha statues. 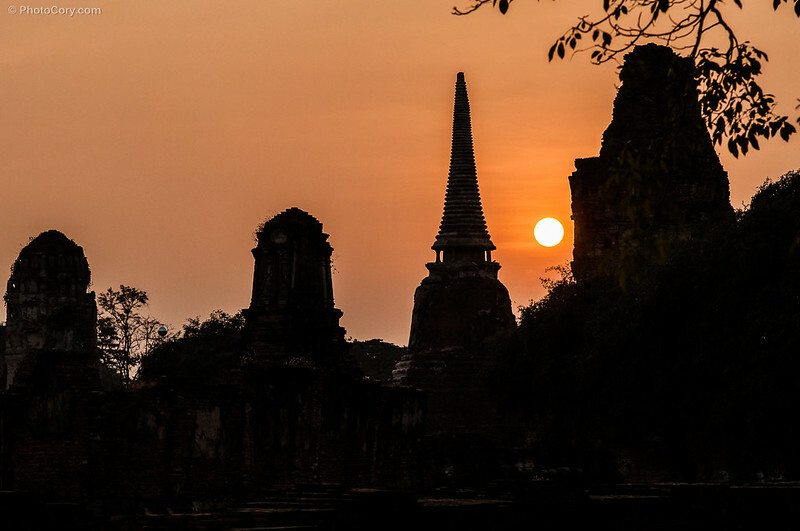 The population abandoned the city and Ayutthaya remained a pile of ruined temples. Va vine sa credeti ca timp de 400 de ani Ayutthaya a fost unul din cele mai mari si importante orase din lume, cu un comert infloritor si peste un milion de locuitori? Ca sa protejeze orasul de atacurile Birmanezilor, regele din Ayutthaya a construit ziduri si turnuri de aparare de jur imprejur, dar din pacate, in 1767 armata birmaneza, dupa mai multe atacuri, a reusit sa cucereasca orasul. Palatul regal a fost distrus, la fel si templele, iar miile de statui ale lui Buddha au fost decapitate. 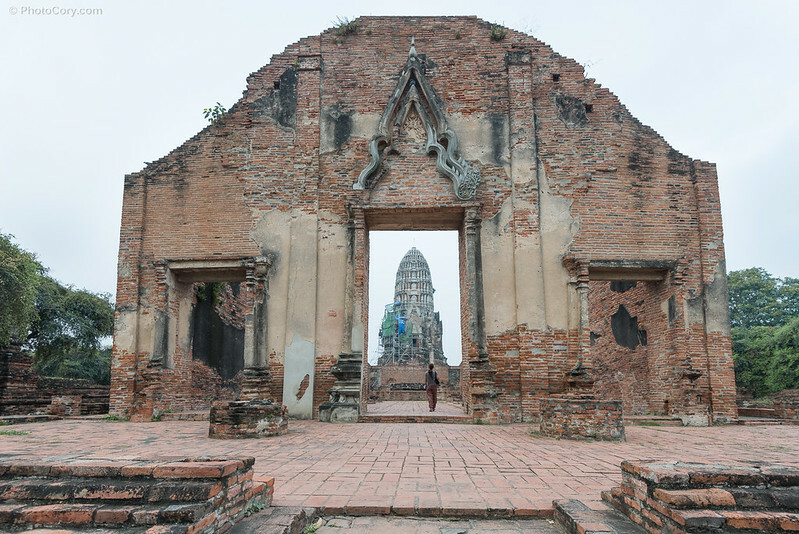 Populatia a abandonat orasul iar Ayutthaya a ramas o gramada de ruine si temple distruse. In prezent centrul istoric al orasului Ayutthaya se afla in patrimoniul UNESCO. 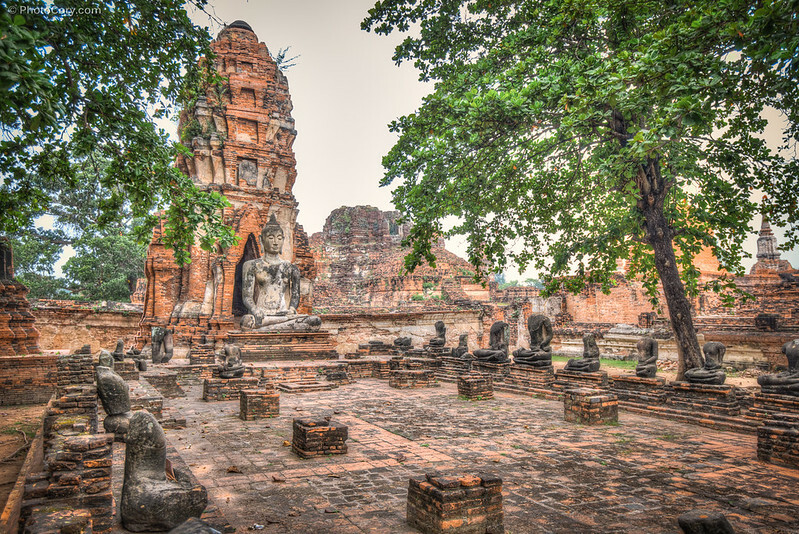 The ruined temples in the historical park in Ayutthaya. You can visit by foot (there’s a lot of walking involved!). 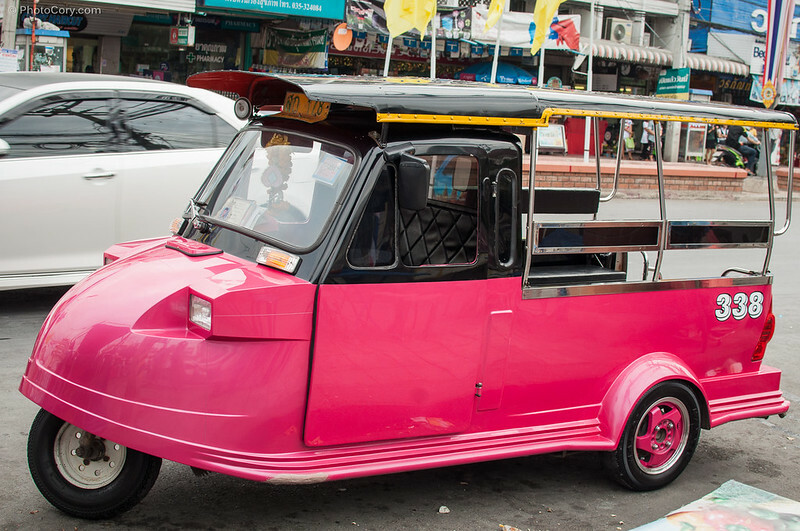 For the sights that are not in the historical park you can take a tuk-tuk (which can be quite pricey compared to other cities). Many recommend a bike, but to me it didn’t seem like a good idea because the traffic is busy and the weather is too hot and humid for biking. 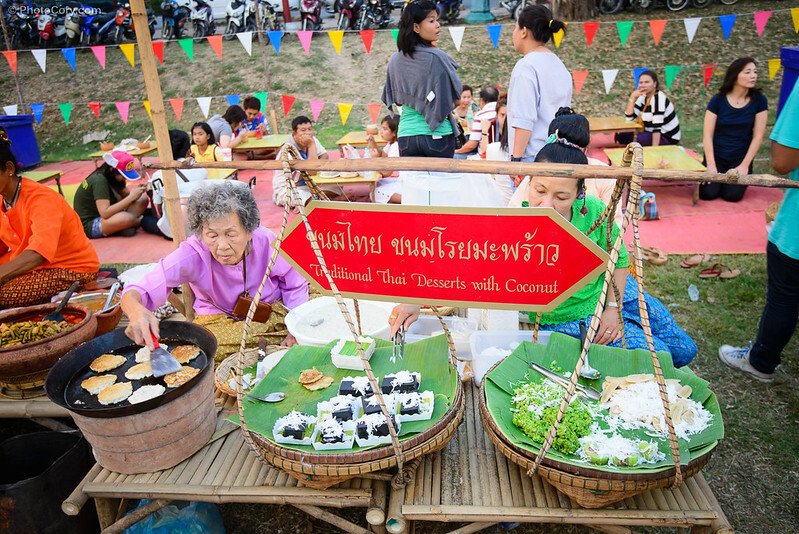 Most of the temples have an entry fee (50 or 100 Bahts/person – up to 2,5 Euros). The seller at the counter doesn’t give you the ticket unless you ask for it (so I assume the money goes into their pockets). Not all temples worth visiting though. 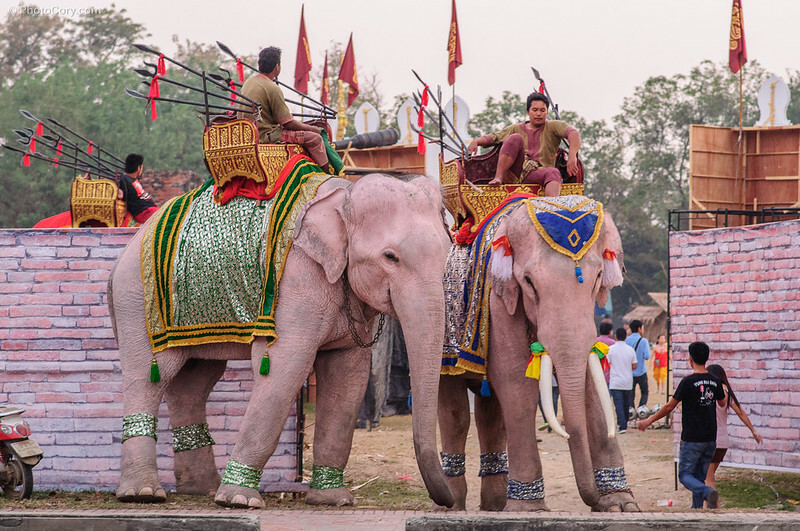 Ce e de vazut in Ayutthaya? Ruinele templelor din centrul istoric – poti merge pe jos, dar neaparat trebuie incaltaminte comoda, pentru ca e muuuult de mers. Multi recomanda bicicleta, dar mie nu mi s-a parut o idee buna datorita traficului, dar si vremii extrem de calduroasa si umeda. Multe temple sunt cu intrare iar casierul iti da bilet doar daca il ceri in mod special (banuiesc ca banii intra in buzunarele lor). Nu toate templele merita banii (costa pana la 10 lei de persoana ceea ce e destul de mult pentru Tailanda). 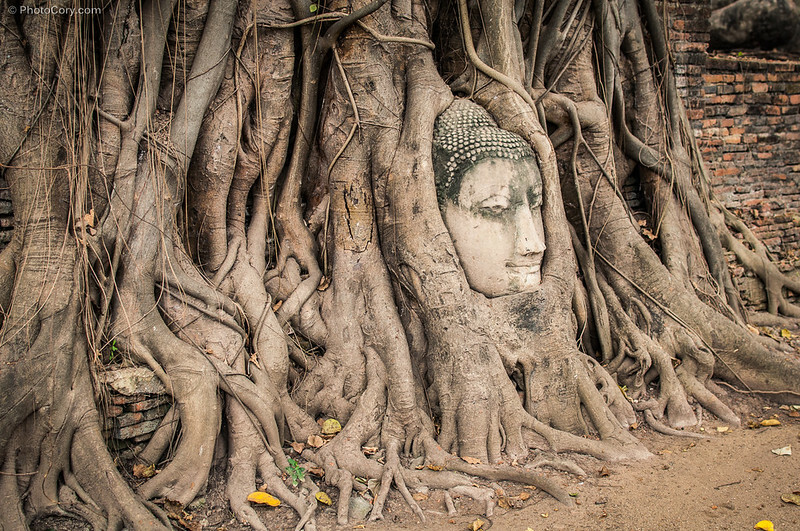 This temple is famous for having a Buddha head entangled in the roots of a banyan tree. 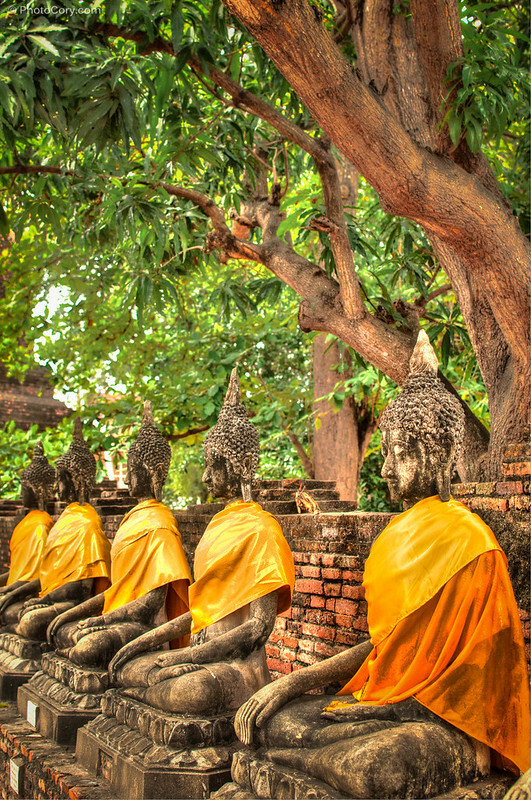 Here you can see many decapitated Buddha statues (The Burmese decapitated the statues when they invaded Ayutthaya, as they believed that Buddha’s spirit was living in them). There is an entry fee and if you go very soon in the morning (before 8) there are almost no visitors. Acest templu este faimos pentru un cap de Buddha prins intre radacinile unui copac. De asemenea aici se gasesc foarte multe statui decapitate (Birmanezii decapitau statuile lui crezand ca in ele se afla spiritul lui Buddha). Si aici se plateste intrarea, iar daca ajungi devreme (inainte de 8), aproape ca nu e niciun vizitator. 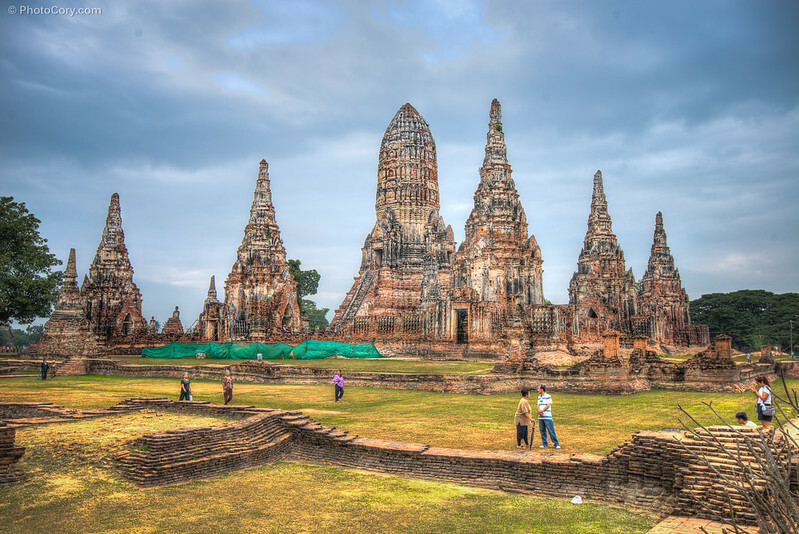 This temple is the symbol of Ayutthaya with its three big Stupas (chedis) in a row. It served as a royal temple in old times. Pe vremuri a fost templu regal si acum e simbolul orasului Ayutthaya (cele trei turnuri aliniate). 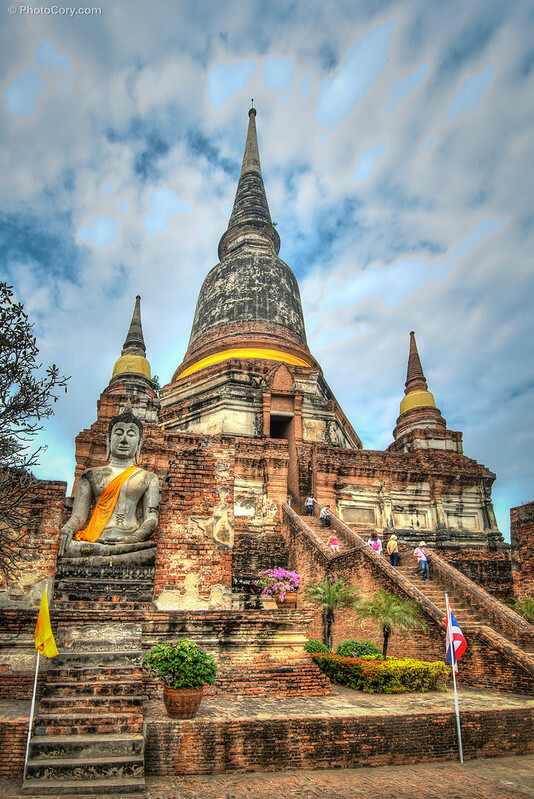 This temple is the most touristic attraction in Ayutthaya and also my favorite. 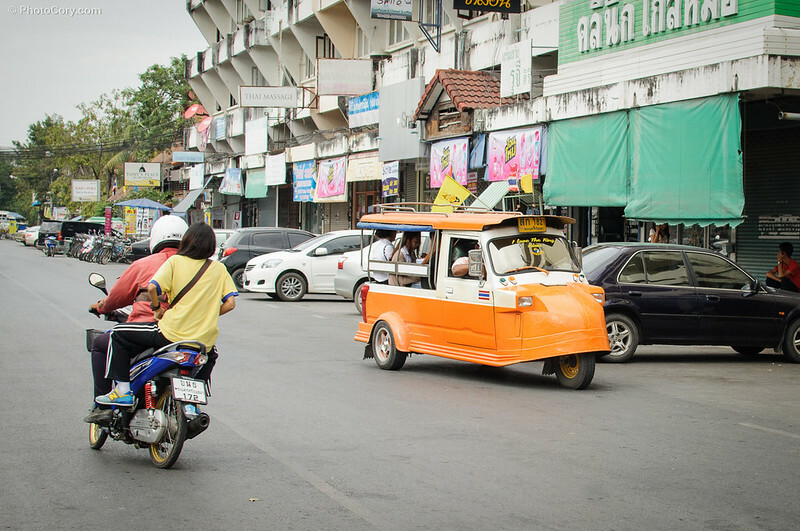 It’s outside the historical park, so we took a tuk-tuk to get there. It has a big central tower (prang) built in Khmer style (symbolizing Mount Meru) and small stupas around it (the continents). Acest templu e cea mai mare atractie turistica si favoritul meu. Se afla in afara centrului istoric si am ajuns la el cu un tuk-tuk. Are un turn central in stil Khmer (simbolizeaza muntele Meru) si mici turnulete in jurul sau (simbolizeaza continentele). This temple is a mix of old and new: old ruins with an active monastery next to it. 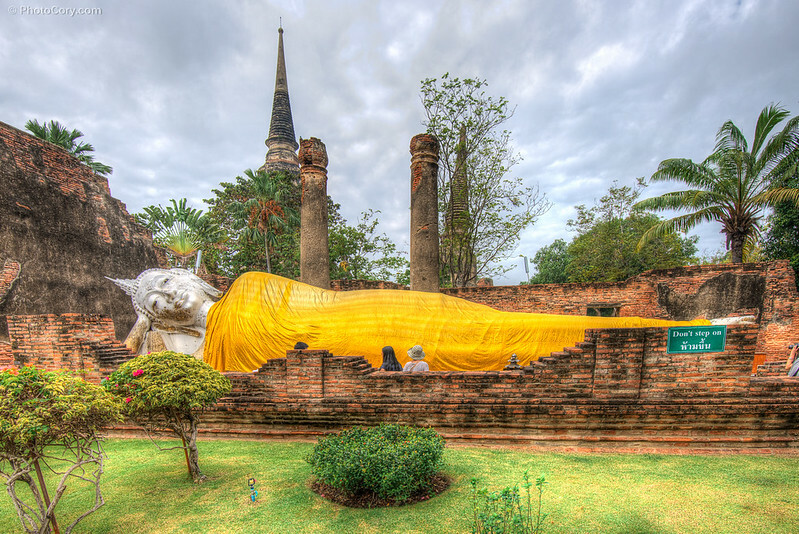 There are many Buddha statues of various sizes around the courtyard and also a big reclining Buddha covered with orange cloth. Aici gasim un amestec de nou si vechi: o manastire inca activa si ruinele de langa ea. Multe statui ale lui Buddha, de diverse marimi se gasesc imprejurul curtii, printre care si un Buddha culcat. This one is really old, built in 1424. The main prang (tower) is under restoration, covered partially by a green cloth, but you can still see old original carvings on it (Lotus flowers and mythical creatures). It can be easily viewed from outside and in my opinion it’s not worth paying to get in: there was nothing spectacular to see. E un templu vechi, din 1424. Turnul central se restaureaza si e acoperit partial de o carpa verde, dar se pot inca vedea vechile sculpturi (flori de lotus si creaturi mitice). Din punctul meu de vedere, nu merita intrarea: se poate vedea foarte bine si din afara, iar inauntru nu e nimic spectacular de vazut. 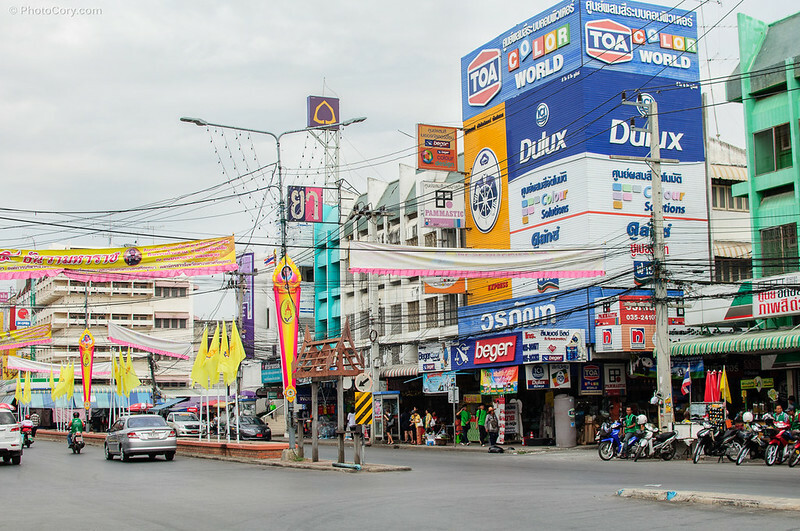 We stayed in Ayutthaya 2 nights, which I found too much for this city (many people come for one day trips from Bangkok – which is more than enough to see the essential). I didn’t like Ayutthaya too much: it was quite dirty, the tuk-tuk drivers tried to rip us off (one even lied to us that the temples open only after 9AM, but he will take us to some temples that open sooner. Luckily we didn’t believe him). 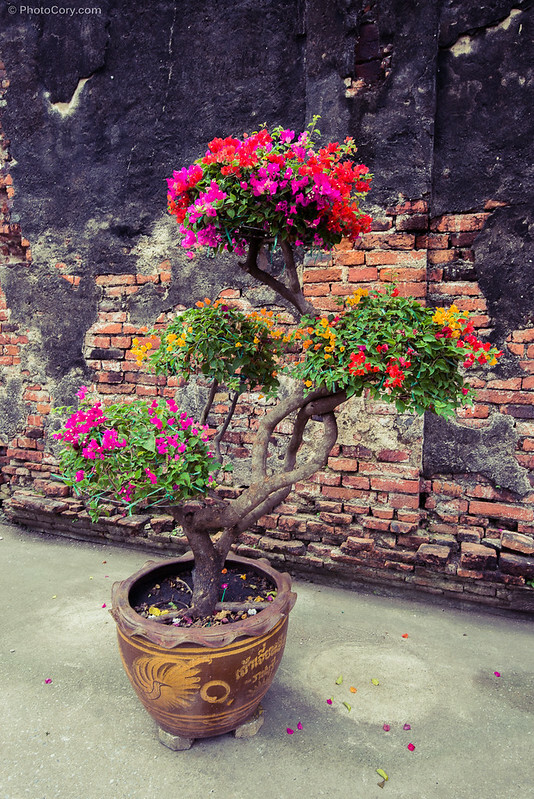 On top of this, the weather tends to be hot and humid all year round. We started sightseeing at 7 in the morning hoping it would be colder, but it wasn’t; I felt I’m disintegrating and melting all day. One evening there was a local fair (with food, lots of people and noise) and we saw pink elephants and funky looking tuk-tuks. Am stat 2 nopti in Ayutthaya (adica mult prea mult). Multi vin doar in excursii de o zi din Bangkok (care e la doar o ora distanta), mai mult decat suficient ca sa vezi esentialul. Merita oare sa vizitezi Ayutthaya? Da, poate, dar o zi e suficienta. Personal, mie nu prea mi-a placut: e un oras cam murdarel, soferii de tuk-tuk cauta sa te jecmaneasca, unul chiar ne-a mintit ca templele se deschid dupa ora 9, dar ca ne duce el la alte temple care se deschid mai devreme (din fericire nu i-am crezut minciunile). Si peste toate, vremea tinde sa fie umeda si caniculara tot timpul anului. Am plecat sa vizitam la 7 dimineata, cu speranta ca va fi mai racoare, dar nuuuu, simteam ca ma dezintegrez si ma topesc de caldura. Intr-una din seri am dat peste un targ local (cu mancare, aglomeratie si galagie), am vazut elefanti roz si tuk-tuk-uri…mai altfel. 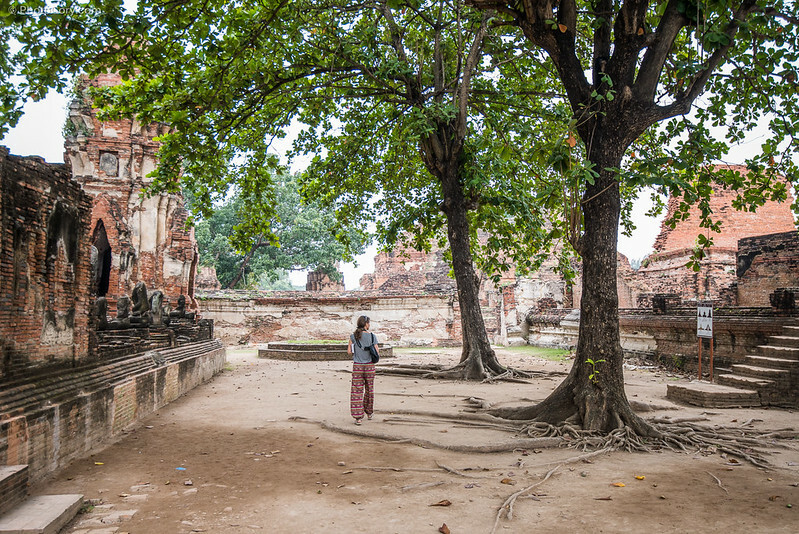 I love your photos…Ayutthaya was one of my favourite places in Thailand! Great photos! My friends and I visited Ayutthaya back in June and we had a blast riding our bikes around. 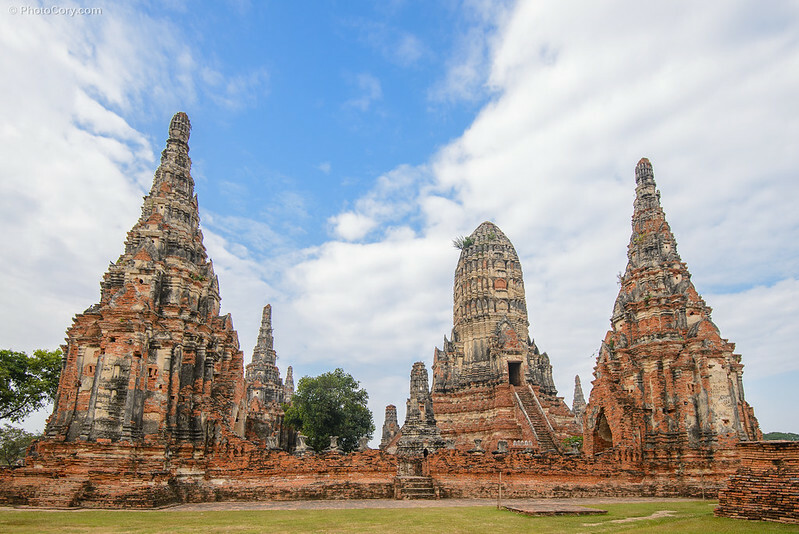 Speaking a little bit of Thai definitely helps…those temples shouldn’t cost more than 50 baht per entry. 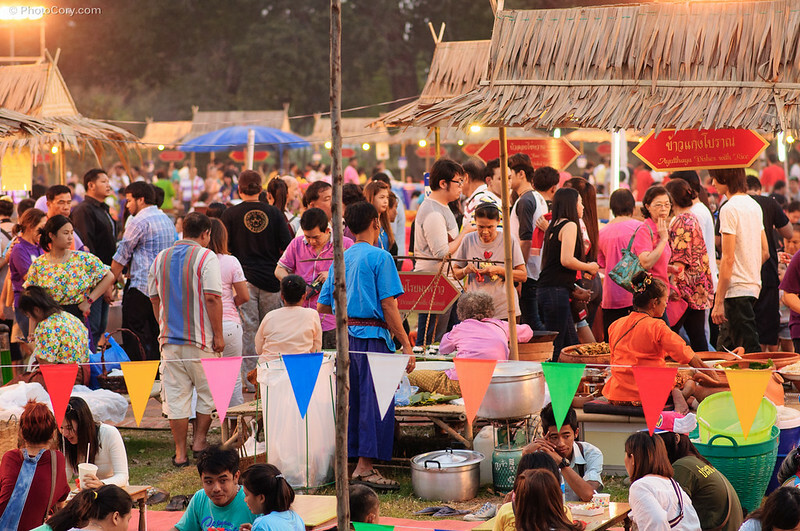 It’s unfair that Thais can go for free and that they don’t offer Thai residents a discount! 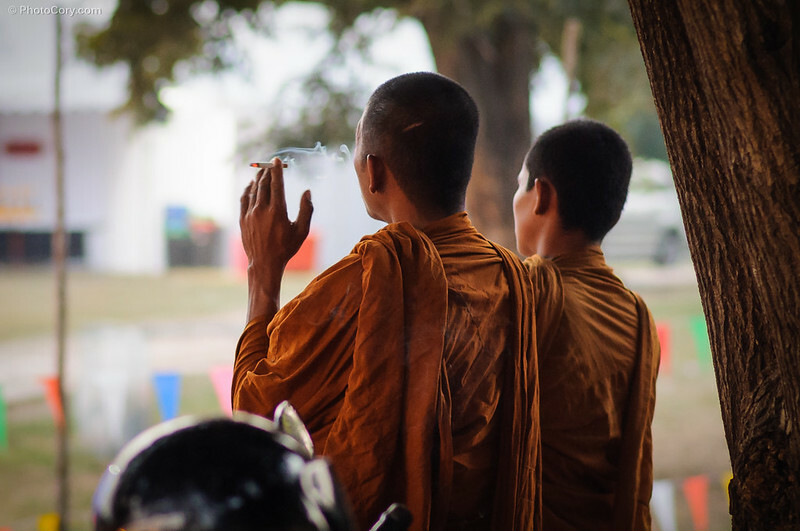 The photo of the monks smoking is absolutely fantastic! such a great shot! 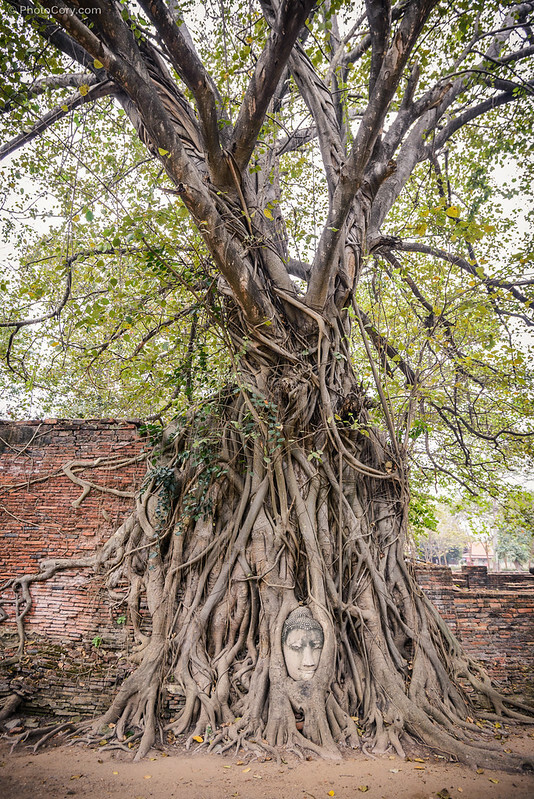 Another gorgeous photoessay and marvelous insights into why one should enjoy a visit to Ayutthaya! I would certainly love to follow in your footsteps there…. Wow! Some of the photos are truly amazing.